Coolin View Guest House is a beautiful building dating circa 1920. The house is located in Bosville Terrace and has spectacular views over Portree Harbour. 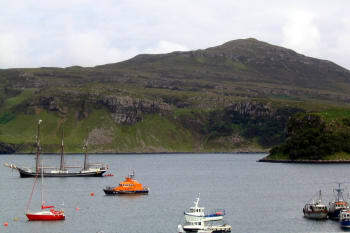 It is located right in the centre of Portree (the islands capital), and is an ideal base for your holiday in Skye. The house has a mixture of twin, double and single rooms, the majority of which have stunning sea views. All rooms are en-suite with private television and tea and coffee making facilities. Guests also have use of a lounge area in which to sit and relax or to sit and plan the days adventure. Most restaurants close at 5 p.m. or require reservations. The bar on the street corner has great whisky! Room was small but with a Gorgeous view!!! Thanks for the stay. Walk around. Scottish music bagpipes and guitar, and wonderful server and services at the grill and bar at Hotel Portree opposite the car park Centre of town. (Since we arrived late, we didn't interact with staff. However, this survey site forces a rating.) We found our stay to be comfortable, very convenient, and a good value. Would definitely stay again if we ever have the fortune of visiting Skye. I submitted reviews on both Bookings and TripAdvisor. Hope they help! If you need a review for your own site, I'm happy to send one for that. We had to check in late as our tour was behind schedule getting into Portree, however a single phone call was all that was needed and we were set up to get our room when we arrived with no fuss. We had a great view from our room and the amenities were great. The location is still close to everything with a Co-op, restaurants, and shops just around the corner. Portree is very walkable, and would recommend taking a little wander. Pop into the shops for some souvenirs, take a peek at the menus of the available restaurants, and get a feel for this cute capital of Skye. It would have been nice to have a room to read books or relax, perhaps shared by the guests. Avoid the Indian restaurant at the bottom of the hill! Perfect location and clean rooms with everything you need. Breakfast had a great choice and staff were super friendly and nothing was too much trouble. Head to no2 restaurant just a short walk away which offers a great selection of food at a good price, wine is excellent and a good selection of alcohol too but the restaurant is very casual which is perfect after a days sightseeing and you just want to relax. Great location and friendly owner. Would recommend to anyone traveling to Skye! Eddie was fantastic during check in - he helped us with our suitcases and answered any questions we had with sights to see. Employees at Coolin View, No.1 & No. 2 restaurants were all also very accommodating and friendly. Would definitely recommend to friends & family, and will come back again! Lindo hotel. Genial ubicación, limpio y excelente desayuno. Stay hear good central location, handy for everything. Great location and facility with beautiful views. Staff available by phone, but not always on site. Within walking distance of most everything in Portree. This was the 2nd time I stayed at the Coolin View guest House. 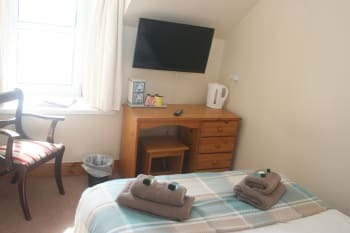 The room was clean and very comfortable, location of the house is excellent for venturing to the town centre, very good views over the bay. Coolin View Guest House was the perfect place to stay in Portree! Our host was kind and helpful, the room was comfortable and cozy and so convenient. We had a lovely view of the harbor, breakfast was delicious and just next door. We also had a place to park our rental car. Make dinner reservations if you plan to dine in Portree. Unexpectedly we were turned away from several places that were fully booked around 7pm. The places we ate at were fantastic though. Location very close to Old Man of Storr. If you plan to do any shopping this time of year, go early because all gift shops closed by 5:30pm which was disappointing since that's when we usually returned from sight seeing. Grocery store was very close by and open 7am-11pm which was great for grabbing food for our roadtrips early in the morning. Lovely place. Very good room. Central location. Fabulous location with beautiful views over the Harbor. Room was a good size, clean and the beds were really comfy. The shower was good with plenty of hot water. Staff were friendly and helpful. Breakfast was really nice a served in the restaurant next door with equally stunning views. The only thing that let it down slightly was the extractor fan in the bathroom didn't work. Lovely local pubs and restaurants with stunning scenery. Perfect location in Portree. Great views. Walk to shops and restaurants. Staff was very helpful in helping us make the best of our two days in terms of sights to see and places to eat. The breakfasts are great too. We enjoyed hiking in the Quairaing and the fairy glenn. The rock of Storrs was also a great hike. I found the owner, Edi, very kind and helpful. Everything Okay. Just wish the landlord had waited for our arrival before drawing the money direct through my visa card on my account in France. We enjoyed staying at Coolin View. Location was ideal for Portree town access. Portree has a limited number of eating establishments. Make your reservations ahead of time to prevent long waits. Possibly the best views over the harbour, comfy rooms warm and clean. Staff especially helpful and wonderful bistro attached. 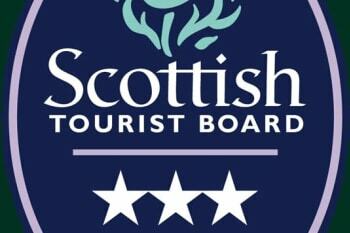 I would certainly recommend it as it was a fabulous location and provided for an enjoyable stay and experience of Portree. Im a porridge eater and would say - give customers a choice of milk or water. It doesn't suit everyone when made the traditional way. Honey/cinnamon can also make it a much more enjoyable breakfast- but the cooked breakfast was spot on and not so large to leave you stuffed. Overall a great stay thank you and very friendly. Very kind and helpfull staff. Very charrming House and very Nice rooms. In august, it Can Be a serious problem to get anything to eat in Portree. All restaurants were fully booked. So book your dinner before you arrive. We were lucky to find a supermarked. Lots to do and see. Be adventurous. The single-track roads are fun, though, the car park for the coral sea can easily become a bottleneck. Superb location with a fantastic view. #1 Restaurant next door was excellent for breakfast and dinner. 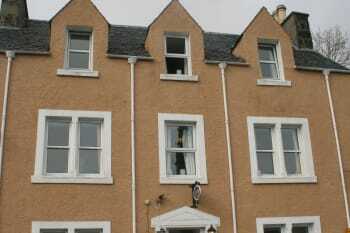 Although accommodation is OK location is ideal being within walking distance of Portree centre. Staff were all very friendly and extremely helpful. Portree has many restaurants and hotels offering entertainment. Good base for touring Skye. Would be nice to have a lounge area. Perfect location, comfortable bed and brilliant breakfast. All at a very reasonable price. Dinner at No 1 next door was fabulous, but make sure you book ahead as it was very busy. Nice stay. Maybe a little more clarity on check in times/process. Not a problem for me but maybe let guests know that most restaurants close pretty early. Beautiful location, especially the views from the room. We came during quite a heat wave, so the room was extremely warm, making sleep difficult. We were hoping there would have been a fan or something provided, but I assume many places in Skye don't even keep fans in storage due to mild and cool weather year round. Breakfast was ok--very small portions. There were four of us in the family room and we found the room much too small to fit four people, especially considering the price. Beautiful guest house. Fantastic views. Helpful staff. Our favourite UK accommodation so far. Location was fantastic & parking was easy and free. We arrived on a late ferry so checked in with the restaurant next door, I cannot recommend then highly enough they were outstanding the service was fantastic and the food was great! Its easy to understand why table reservations are necessary at peak times! Our room was on the top floor, my first impressions were that it was very warm and cramped. However it was a hot day, the room was clean and the toiletries etc were great. The bed was comfortable and the shower was powerful. For one night it was perfect but for a longer stay a bigger room would be better. The restaurant at number 1 was fantastic the service was great and the food was delicious! Don't leave without checking out a shop called OR (on the main street) for quirky keepsakes and quality gifts. Go EARLY to the fairy pools by 10:30AM it was resembling Blackpool! Enjoy Skye and if you can visit Harris! Have dinner there us was great. We were very happy! Coffee machine isn't working too well anymore. Staff were wonderful and went to great lengths to ensure that items I stupidly left in room were returned to me. Wonderful, friendly staff. Great location and beautiful view. EDDIE WAS A GREAT HELP TO US FOR OUR LIMITED TIME. GREAT LOCATION; CLEAN; COMFORTABLE; JUST WHAT WE NEEDED FOR OUR STAY. 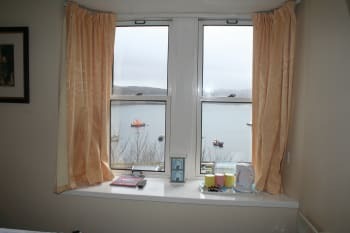 Great place to stay in Portree, comfortable room with great views. Easy walk to all restaurants. Easy check in/ out. Staff very helpful. Very comfortable and clean. The view out of the window is perfect . Most beautiful view from our window of any place we have stayed. Very friendly hosts. Could check-in way before the time. Organized a breakfast in near-by location. Wow! A magical place to stay. The view alone was worth the price. Best night of my 11 day visit to Scotland. Ask Eddie where to visit. He sent me on a wonderful tour of the north part of the island, complete with a detailed map. Also, no need to walk down the hill for dinner. The restaurant right next door was terrific! The room has a spectacular view of the port and free parking on the sidewalk opposite. Eddie was very kind talking in a way that we understood him. He explained where to go both in the town and on the island, he even recommended places in Glasgow. The room had a kettle and a Nespresso machine. The bathroom had heated floors and was very clean, as was the room. The breakfast was very good, they cooked it at the moment. They gave it in an annexed restaurant with spectacular views. Walk. Down the hill from Coolin View past the Co Op and on the corner there is a great take away lunch shop. The selection of soups is good and excellent value. Sandwiches and coffee all great. For dinner continue walking down the street towards the square. Stay on this side of the road walk past the church to the pub called THe Isles. Good food great value! Check in was quick and smooth. View was breathtaking from the window of room. However there are no shelves to keep the toiletries in the shower enclosure. Bit of inconvenience. Overall a satisfactory stay in Coolin View. Book in advance for the restaurants nearby. Good place to stay in Portree. Nice Restaurant for breakfast. Thanks! If you want to take a tour of the isle, book with Real Scottish Journeys (SkyeBus)! Hands down, the best tour I've ever been on. Très belle vue. Les chambres sont propres et bien équipées. Le petit déjeuner servi dans le restaurant juste à côté est parfait. Portree est très bien situé pour les visites de Skye. Nous recommandons! Location was great for exploring Portree and Skye from. We stayed in room 9 and check in was straightforward and staff friendly and helpful. The room itself was cosy and clean with a fantastic view of the harbour. Had everything we needed and breakfast choices were excellent to set you up for the day. Thank you! Talisker distillery is a short bus journey away from Portree to Carbost, where you can also visit the Oyster Shed which is a 10 min walk from the distillery and has an excellent selection of seafood - unfortunately it was closed at the time of our visit so make sure you check their Facebook for when they are open! Dulse & Brose and Cuchullin were our favourite spots for dinner. This was our second stay at Cool View in two years and hope to stay again in th future. Claire who welcomed me was absolutely lovely, so too the other lady at breakfast in the morning, I'm sorry I did not get her name. Just ask the staff, they are so lovely. The date we arrived is in February. Lots of shops and restaurants are closed until March or April. Comfortable and well equipped family room - lovely breakfast with a view! Had a great comfortable night stay. Very charming and comfortable place. Nice Scottish breakfast in the adjacent restaurant. 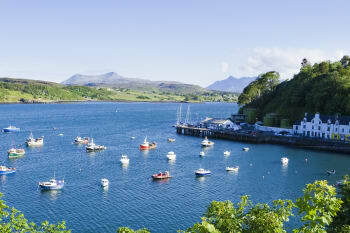 Very central location in Portree with wonderful, picturesque view of Harbour and some beautiful Skye landscape beyond. Very friendly and helpful staff. Thanks again and will be returning! Lovely room with great shower,always clean and comfortable. Very nice guest house. Very clean. Plenty of pubs and restaurants. Hearty welcome by Eddie with introduction of what to do and where to eat on the island. Great view of the bay. Very clean room with all facilities you need, including coffee machine. The restaurants and pub on Bosville Terrace were open (with great food) while many others were closed in winter. We also ate dinner at The Three Chimneys which was a memorable experience. Friendly and helpful staff. The room was warm and very clean. The bed very comfortable. In the room the coffee machine was a very welcome surprise. Great also the price! Perfect journey! Very beautiful area, we had good weather even for a late November, most shops still open, information office was open on Saturday afternoon were we were given additional info, 2 co-op shops in town, few nice pubs and restaurants on the seaside. 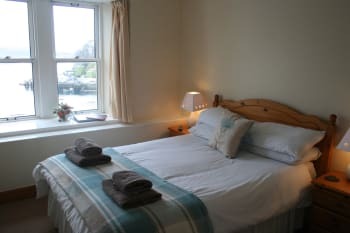 From the joyful greeting upon arrival to an exceptionally clean and charming room the choice of the Coolin while in Portree is an excellent one. The beautiful images of the town from sunrise to sunset are a lovely bonus if you step across the road for great photos. The location is walking distance (all hills, so bring walking shoes) from shops and restaurants and it’s easy to feel like a local from the moment you step away from your bus or car. We loved our stay, hope to someday visit again, and highly recommend the Coolin Inn! Most shops, as in other Highlands towns, close up by five, but restaurants and pubs were open later for the many tour buses and cars that seemed to arrive with great frequency. While obviously a true tourist town, there is a lovely sense of history and charm that breaks through in the friendly area. Staff where very welcoming, Would definitely stay again lovely. The room was really large and had more amenities than most other B & B's of it's size. John was very friendly and accommodating. We enjoyed the continental breakfast. It had many options and quality items available such as the fresh fruit salad. Enjoyed the walk to the fish ladder. There is a nice visitor center there with free toilets. Also we did another trail walk from the center of Pitlochry (Eradour Path). We either got off the path or the path was not marked correctly, but enjoyed it anyways. Hattie's had good pastries, but the sandwiches were nothing special. Cafe Biba had a nice atmosphere and good food. Quaint town and beautiful fall colors. Would have liked more time there. Room was small but had a splendid view of the harbor. Bathroom was newly renovated, and the arrangements for breakfast were very convenient. There was no common space or lounge. The nights were quiet allowing a good night's rest. Overall a satisfactory experience. The Granery Restaurant is recommended for a well prepared and presented meal. I was a pleasure to stay at Coolin View Guest House. Unfortunately I could only stay there for 2 nights but wish I could stay there for much longer as I felt warmly welcomed. You just feel like you're at home. Owners are extremely kind, they will recommend restaurants etc. Thank you! Had a wonderful time! The room was quite small, but clean and with everything we needed. The breakfast was really great. The stuff is very nice. The location is perfect with an amazing view. Great place to stay. I definitely recommend it!!! Everything is great!!!! Eddie is the epitome of a goood host; friendly, well informed and willing to provide needed services. The location above the harbor is beautiful and a short walk to downtown or the upper harbor. Breakfast was very good in Eddie's restaurant next door. Very cozy, very friendly. The shower was great and Netflix was an awesome addition! Sorry, inside the double glazing Windows it was not very clear. A pity. Only a few minutes away. Very very nice view over the Harbour of portree. Enjoyed our stay here. Such a convenient location. Definitely drive around the peninsula. Great location and the room was fine, but this place is not quiet. Maybe it was just where we stayed (first floor, window on main street), but we could hear everything that happened in the lobby, upstairs, and on the street like it was in our own room. Otherwise, we had a great stay. We had dinners at The Granary and Lower Deck, and both were fantastic. I'd also recommend the Old Man of Storr hike. Very friendly and helpful owners who made us feel very welcome. Our view was the classic view you see if you look up Oban on google images—the painted houses. Nice breakfast too. Oban is a great little town with lots of character. Lots of nice restaurants too but be sure to reserve a table early as they get booked up fast. Warm informative welcome which helped me orientate and decide how to spend my limited time.Very good breakfast. Don't worry if you can't park directly opposite the building. The free parking in the town is five minutes walk. I was travelling alone so didn't have a spare body to jump out, move bollards or stop traffic! 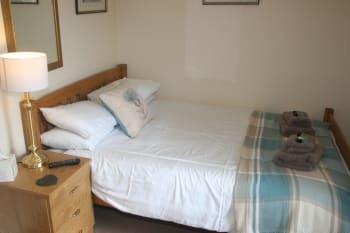 Friendly warm welcome, tidy warm room, lovely location overlooking the harbour. The Coolin View Guest House is a lovely Guest House overlooking the Harbour of Portree. The Lochview is amazing.The staff is very considerate and helpful and the food in the adjacent N.1 restaurant is great. Very nice location and attentive staff. We were at the top so a very long staircase for someone my age with knee replacements. Restaurant is next door and again upsrairs, but that is the nature of buildings on Skye. Would certainly stay again , but would ask for a lower floor. An awesome place to stay. The wife and I loved it. We could see the bay through our window. We stayed in the upstairs (compact) one bedroom. It was small as to be expected but hell you don't stay in your room much anyway. We met the owner (Ed) a very nice gentleman. and a huge kudos to mary. The food at their restaurant next door was excellent. We don't have a bad thing to say about the place. And we would recommend it to anybody. Thank you Ed and Mary for a most awesome stay. Excellent location. Friendly and helpful staff. Eddie a good source of local knowledge. If you want to eat dinner in Portree you need to book a table as we found all restaurants full until 9 pm. Might be down to the time of year? The host was so nice and made us feel right at home. Our room was up 4 flights and my husband has a heart condition so it was wonderful that our host carried our bags. The room was small but had a wonderful view and was spotlessly clean. We loved having breakfast in the next door restaurant. It was delicious and well serviced. We also ate dinner in the same restaurant and it was by far the best meal of our trip so far. We had a nice meal at the Portree Hotel. We enjoyed our tour of Skye by Skye Scenix tours. The hostel laundromat was a lifesaver. Recommend you advise guests to make dinner reservations before their stay if possible. Excellent location, parking can be challenging, amazing staff, very good breakfast with friendly service next door. Great breakfast although on the second day my partners order was not correctly fulfilled. I'm sure a more spacious room with a view over the harbour would be perfectly delightful, but a very cramped single room with a view of a stone wall, 3 feet from the window did leave a little to be desired. Breakfast is very good, but somewhat hectic. Nice accomodation and lovely People. View was phenomenal! Room is cozy...bit small, two people need to be compatible and work out space. But, it can be delightful place! Breakfast at No 1 is best, so good we ate dinner there. Very nice to be walkable to everything in Portree! Must eat at No 1 Bosville Terrace restaurant. Open to public for dinner at 6 pm. Brilliant husband and wife team with great staff and continental flare on traditional dishes. Delicious menu options...all fresh local resources. Room is tiny but it is the only drawback. Views are splendid. Located in the center of Portree which is great. very kind host, very convenient location, very clean room and toilet, comfortable bed and wonderful breakfast. Our ONLY criticism was that there was no Guest Lounge. Book your restaurant before you come. That includes the very good No 1 Bosville Terrace, which I believe is owned by same people as Coolin View. The restaurant has only a limited number of covers, so fail to book at your peril! It was a lovely meal on our 2nd evening. Beautiful views of the harbor. Helpful manager with great information about the island. Scorrybreac trail around the point was spectacular with a dram at the Cullin Hills Hotel Bar the perfect post hike activity. I was a single elderly traveller, using public transport and I found the bus drivers to be very helpful. The Tourist Information people were outstanding in their advice and suggestions. Portree is a beautiful town and the towns folk are very kind and helpful. Judith from Australia. Very comfortable, well maintained, helpful people. The breakfast was outstanding. Great views. Convenient to local sites. Parking available across the street! A big deal. The Indian restaurant down the street Taste of India was very good. Vegan options. Next time I hope I am in time to get a front facing room -- the view is incredible. I arrived early but was able to drop off my luggage without a problem. Thanks for a great stay. If you get there early, as I did, just call the number on the door and you will be able to drop off your luggage. Book early and get a view of the loch ..
Best to book restaurants in advance if you want to eat out. Each evening it was a struggle to find somewhere to eat. The compact sea view room on the 2nd floor is indeed compact but it has a great view and an excellent bathroom. Bed is a bit small but the description makes it clear what to expect. Easy walking distance of variopus eating options. Single room booked. Sea view great. Bed size and comfort was very good. 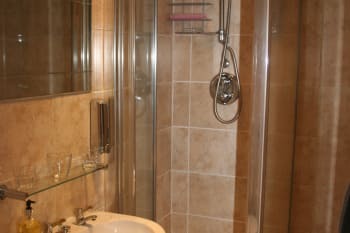 En-suite couldn't be smaller, particularly the shower but still usable and clean. Thin walls and other guests sometimes noisy. Breakfast in neighbouring building was OK. Polite host. All local bars and restaurants I tried were good. Merchant bar is extremely popular. Could not ask for a more stunning view or friendlier, more efficient staff!! The owner, Eddie, greeted us and gave us invaluable tips about driving and great places to go. The food at the restaurant is top notch. Clare took especially good care of us in both the guest house and the restaurant. Thanks to Gavin and Mairy too. Definitely recommend. Although the room was very small, we had our our toilet & shower. It was very clean. The staff was very friendly and helpfull at arrival. Breakfast was excellent, this staff was also very friendly. You can park your car in front of the entrance. We did a lot of hiking. Lovely lady running the guest house - advised us on a nice place for dinner at the local inn (fish and chips was grand!). We only stayed for 1 night, but no complaints at all. Breakfast was standard, but good (with a nice fish option if you fancied it), and everyone was nice. Très bon accueil. Dommage que la vue de notre chambre donnait sur les poubelles, mais pas très important. bon restaurant. I really appreciated the warm welcome from Eddie. The road to Skye was closed for the afternoon into evening so I arrived rather late. Eddie didn't miss a beat. Very happy start to my visit. Fabulous staff. I book singles, so can only speak for one. My room was just big enough for my needs and the tea set up on an extra wide window sill. I spent many hours there with tea, writing and watching the storms come through over the harbor and the mountains beyond. Wonderful. The bathroom was very nicely modeled. The staff were so friendly and the breakfast next door a great start to the day. I peeked into a double room as it was cleaned and it seemed quite spacious. Great place to stay whilst in Portree short walk to restaurants and the square. Friendly staff full of advice on what to do whilst in Portree. As well as breakfasts we had dinner at No 1 Bosville on Saturday evening between us we had mussels scallops and amazing smoked haddock which were all cooked to perfection, and reasonably priced. The service was great. Feel like home here. Nice bathroom, nice shower hit , nice light, nice hair dryer. The beautiful lake view just outside the room window. A bench in front of the hotel where you can have a drink or meal with friends and enjoy beautiful view at same time. Best experience ever! Had a brief but very pleasant stay, thank you! Very pleasant staff, breakfasts yummy and situation perfect. Views from site stunning. We can heartily recommend the boat trip. Portree hotel good for meal and music. Cuchulin restaurant first class for foodies but booking essential. I would suggest the Fairy Pools for a walk or/and swim, The Sligachan for a meal, The cuillins for climbing and the Quirang for spectacular views. I have a very warm welcome and found a friendly staff, got a great breakfast. Everything, also the room was great! The whole Isle of Skye is a dream, my favorite place was the small village Elgol. A hard 19 mls single track road way, but with to see. Great support from the staff and a very good location in town with views over the harbor. Not a fault of Coolin View other than you can hear other guests and outside traffic. It was quite noisy until late. The view was great and the beds were comfortable. The restaurant next door was very good. Great location. Prompt return of my kindle which I had left in the room on charge silly me. Nice breakfast in restaurant next door to guesthouse. The guest house has excellent views over the harbour. Every one was friendly and helpful. Breakfast was in the restaurant next door, and provided a good range of options. We went to the restaurant next door for evening meal,and would recommend it. Very handy, and a good choice of food at a reasonable price. A really lovely place to stay, very homely and welcoming and a great location. Staff very accommodating and friendly. Beautiful breakfast with plenty of choice in the restaurant next door. Would definitely be back. Just perfect My only observation was the breakfast times I would have thought a 10am cut of period instead of 9am would have been better. Amazing spot! Friendly staff that gave us excellent advice about the surrounding areas! Nice welcome with accurate touristical information. Good stay! Flawless service. Great breakfast. Beautiful room with a comfortable bed. Will be back! The Granary - fantastic restaurant The restaurant 3 doors down is also fantastic - forget the name sorry! Fairy pools and drive around the north of the island are also a must! Perfect in everything. The room was spotless, warm and cozy. A perfect view, perfect localization. Very welcoming. I loved to stay there. You must see: Old man of Storr, Glen Fairy, Kilt Rocks and Mealt Falls, Talisker Destillery and eat at Oyster. Really had a nice comfortable stay. The bathroom is somewhat cramped (twin room), but nothing to complain about. Recommending to others. it is one of the best hotels i have ever lived. it has pretty beautiful view and the service could not be better. The timetable of us was changeable and we arrived pretty late, but they still provide ways for us to check in. very accommodating to last minute changes, great place to stay. the restaurant next-door had great food, and was really reasonably priced. Lovely friendly welcome, room was clean and warm, the breakfast was as ordered, with a little added haggis with was really appreciated. Thank you. The nicest staff and great location in town. Lovely stay on Isle of Sky. FYI: Often times reservations are needed for the restaurant next door which is well worth it. Very clean and comfortable room and great location. The Isles pub was great. Good food and nice atmosphere. Staff at Coolin View were extremely helpful in showing us our room and helping us with our luggage :) It was a fuss free experience, and definitely very enjoyable! Friendly welcome with genial host, Eddie. Rooms great, breakfast very good. No complaints at all. Eddie was very kind and strong! carried both bags up the tight staircase with ease...we missed him when we returned to Edinburgh. Breakfast was easy and delicious. A truly great stay for such a quaint town. shops close early, by 5pm...so get your shopping in early. Meet the people, they are lovely! We stayed here the night before heading to Uig for an early ferry to Harris. It was excellent, totally suited our requirements and we had a very comfortable stay. The breakfast was lovely and the staff are so friendly. When we return to Portree then we will definitely stay here. Good location, beautiful view and excellent restaurant next door. Loved the breakfast restaurant next door, also enjoyed Dulse & Brose quite a bit. The view was astounding!! Very nice 2night visit to Coolin View Guest House and nice to have Eddie give us an idea of where to go. We were so lucky in that the weather was fabulous and we saw much of the Island. Our room was all we would want at the top of the house,two very comfortable beds and nice en suite, plenty of wifi. All in all a very comfortable 2 night stay. The North end of the Island around Staffin is stunning and a must to see. The wonderful restaurant next door to Coolin View called NO1 is fabulous as is Marie who runs it. We ate there for breakfast and dinner both days,just the best. Thanks for everything. The WI-FI is a bit spotty or no service at all. Beautiful wee room with gorgeous decor. Was very busy at breakfast but as we had to get the ferry we were given priority and made a bacon roll to eat quick before we left. This was very thoughtful and much appreciated. Very friendly welcome and comfortable room. Good continental breakfast as well. I can recommend The Highland Bar,great food, lots of coctails and reasonable prices. Very comfortable and cosy place in the beautiful land. The people were really welcoming and nice as well as always here if you have a question. Clean, comfortable and ideally situated in Portree with great views over the harbour. Everything was great. If I come back to Skye this is where I Will stay. Great restaurant right next door. Convenient to shops and P.O.. Great views. Highly recommended. Found staff friendly and helpful during our short stay, nothing was too much trouble in helping out and we wish all the staff our thanks. Dedicated parking in front of the guest house is limited to about six cars but there's plenty of parking a sort distance away in the town center. Very clean and spaceous, amazing breakfast! Incredibly large Whisky collection in the beautiful barroom! Very helpful and friendly staff. Breakfast is a little basic compared to a lot of B&Bs, but I recommend the porridge. Portree is small enough that all pubs and restaurants are within a few minutes walk. Parking looks like a problem when you arrive, but there are places just for the B&B right in front; don't be put off if there's a rope across. The Cuchullin restaurant was very good. Jim Welcomed Me , and was very Kind & Helpfull. Lovely Clean room . Nicely Laid Out Bathroom . Loved it even though I was by Myself ( and an Old Lady ) I felt safe & Secure . For the Restaurant ; don't go any further than Next Door . Food Great , Service Great also . Comfortable Surroundings . Ed and his staff are helpful and friendly. We enjoyed staying at Coolin View. It's location is right in Pirtree, close to stores, tours and restaurants. Recommend! Book restaurants a day or two ahead in August/September. Recommend Sea Breezes, No. 1 Bosville for dinner. Don's Taxis provided great service as we had no car. This guest house is in a perfection location and front rooms have a spectacular view over the bay and it is very near village centre. Parking is at a premium but the owner was really helpful about moving his car so we could get a slot near the guest house. Only downside about this guest house is the breakfast which is limited. Croissants, oatcakes or rolls would have helped. Scenery spectacular and close to village centre. Rooms clean and a reasonable size. Owner very helpful. small but cosy room. Freindly and kind staff. Beautiful view on Potree bay. Coolin View offers great low priced accommodation centrally located in town within walking distance of just about anything you'd want to see. Jimmy is a great guy who also runs a nearby restaurant. Avoid the Granary in Portree, the food is so-so, the price is moderate but the service absolutely sucked. The Antlers Bar and Restaurant has live traditional Scottish music which is fantastic. Edward was very friendly and accommodating even while running his restaurant. Gave excellent advice on a wonderful seafood shop, The Oyster Shack, for our trip to Talisker in Carbost. Nice vies of the harbor right from the room too. Everything we needed for our stay in Skye. Nice clean place in the centre of town. Great view out the front. Friendly helpful staff. Everything was great. Beautiful location,room,shower toilet. Continental breakfast was fine,but for £75 a night, I think a cooked breakfast would have been in order. Boat trip from the harbour to see Sea Eagles,gulls,gannets,seals, and maybe dolphins. Very cheerful atmosphere and charming staff! Great location, comfy beds, nice breakfast served by lovely staff. Jim was very welcoming and helpful on arrival, giving us advice on places to visit.Car parking space was a bonus. Would definitely return. We ate in 3 restaurants, The Lower Deck at the harbour, which was great. The Italian which served amazing pizzas from their wood fired oven, a must if we return.Lunch at the Granary, recommended Skye Batik clothes and accessories sells some lovely things and free coffee is on offer from the really friendly staff.Aros centre is also worth a visit, restaurant, shop, cinema. Nice friendly guest house. God breakfast next doors. Portree is a nice town excellently situated on the island. A lovely, friendly guest house, with well decorated, clean rooms. Ideally positioned, with beautiful sea views over the harbour. There is free wifi available but it didn't work very well for us - I think that seems to be the same throughout Portree though! For food, I'd recommend going to The Granary restaurant at the square. Delicious food and lovely staff. Very lovely accomodation. Amazing view, owner very friendly and helpful, great place. And very enjoyable breakfast. Ask for a room with view on the harbour. The restaurant in very convenient. Book a tour of the Isle of Skye. Visit the Talisker Distillery and the Dunvegan Castle and Gardens. It was a wonderful location and staff was great. We totally enjoyed our stay and would do it again. Only negative it was a little loud. Very friendly staff, amazing view from the rooms, and very cosy. The staff will guide you in wich atractions are suitable relative to weather conditions. If you have any restrictions about climbing stairs, let them know in advance, as most BnB they have no lift and the stairs are narrow. Perfect base to explore the island of Skye, if you need to suply there's a market 20m from the guest house, and a good restaurant just beside Coolin view. 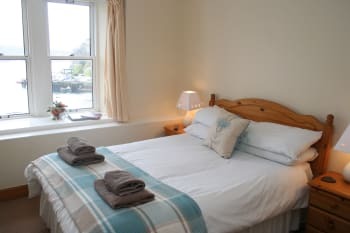 Very warm welcome and excellent tips on local attractions, Restreraunt has fantastic food and a great atmosphere it was a wonderful three day trip, beds where comfortable and room 4 had a great view of the harbour. Thanks Coolin View. Fairy pools The Quirang Old man of store Kilt Rock The Stein Inn Dunvegan Castle,gardens and seal trip The Merchant bar after a long day All where great to see and made Skye a great trip away with great scenic views and lovely weather. Excellent location and nice restaurant :) The room was lovely, very quiet, with a fantastic view on Portree harbour. Thanks!! Did a tour of Skye with Bill from Real Scottish Journeys, fantastic guide and beautiful places to see while traveling in a cosy minibus! If you want to dine in the harbouring restaurant book or get there early as they up very quickly. Really enjoyed our stay perfect location Shame breakfast wasn't included but I understand that a work in progress Will stay again! the room was very confortable. we were well welcoming. we can have breakfeast in the nextdoor. there is a lots of things to see. Great location. Will stay here again. There is plenty to do on this beautiful island. Lovely little place right by the water with great easy access to the main roads of Skye. Didn't really see much of the staff but when I did they were lovely and very helpful. Would definitely stay again! The staff recommended a few places when I checked in, including cafe arriba which had some truly great food. Definitely try some of the cake! The place is right by the A855 which gives exceptionally easy access to places like the storr and staffin beach too. If you're on that road keep an eye out for the skye pie cafe! We had a fantastic stay at this hotel, would highly recommend it. It has suprerb views of the harbour and we were very lucky with the weather, the night views were stunning. Thanks again. The city link bus service is very good. We also ate at the granary restaurant which was lovely, excellent food at very good prices. We also done a tour skye trip which was also very good. Eddie was very welcoming and had a great tips for visiting the area. The hotel was perfect and the view was phenomenal! We thoroughly enjoyed our stay and would love to come back again in the future! There is so much to see and do on the Isle of Skye. We loved hiking up the Old Man Storr! I would recommend making reservations for whatever restaurant you would like to eat at in Portree as they do fill up quickly. 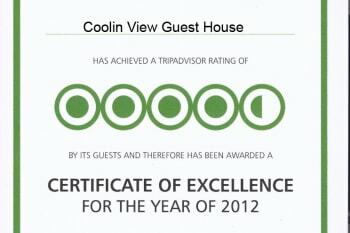 We had a delightful stay at the Coolin View guest house. Such a beautiful little nook of the world. We also enjoyed meeting and speaking with Eddie, the innkeeper. Would love to have the breakfast element added... best of luck getting that license! We will look to return next time we are on Skye. We really enjoyed our stay at Coolin View! The location is just superb with a fantastic view. We wish we had booked more nights. Thank you very much Eddie for your valuable tips! We will be back again! Fantastic hotel with great pier view. Eddie was very helpful and gave us some amazing tips! Very nice manager, clean room, hotel well situated and very charming, we strongly recommand. Nice pub in the same street and good restaurant on the main square in front on the bank and the bakery. Location is unreal view over the harbour is brilliant. Probably the cleanest place I've ever stayed so neat and tidy and everything smelt amazing towels, bed etc. Jim(owner) so welcoming and easy, really nice man. Getting a room with a view is worth the extra cost, even if you get in late like we did - what a way to wake up! Great stay, and great value for money! It was amazing stay although we're shocked by the electricity shutdown when we arrived. But as long as the water still working it didn't matter. Best location, the view outside the window really holding us not to check out soon. Overall it was really nice staying at Coolin house. Just a little opinion, small fridge provided may complete the room facility. Have a great stay. The staff was very nice and help us to book taxi tour and bus. Very great stay. will recommend to our friends. The weather of isle of skye is too bad in the winter. Should come in the summer. I stayed at Coolin View after missing my ferry and what a warm welcome I received from the owner . Although I was only there a short time I felt very comfortable and the owner was extremely helpful . My room was cosy and comfortable . The Chinese takeaway "the fat panda " is a must fantastic food ! We arrived at the guest house and received a warm welcome from Jim.The rooms were top of the house and they were clean and warm.Nice dining room and we were even served with a continental breakfast at no extra charge.Excellent location in Portree. Was also given some local knowledge and places of interest to visit. Really nice break.I would certainly recommend the Coolin View for any visit. The Portree Hotel was busy and the food was great. Due to the time of year,most bars were a bit quite, but friendly.Coolin View is ideal for a base. Excellent stay here and fantastic value for money, would certainly recommend it and hope to stay here again some time. Talisker distillery is a must: get on malts.com and print off a pass for free entry. Also enjoyed a bus tour with Tour Skye which we all enjoyed. Finally, if you're going in November, bring decent waterproof and windproof clothes! We had a very enjoyable stay, the staff were friendly and attentive. One thing the mattress on the bed was a bit hard but other than that everything was fine. The best thing was the view out of our bedroom window, when the mist cleared you really did get a lovely view of the snowy Cuillins! The Portee Hotel was anice place to go for an evening meal. Quite a lively atmosphere and a short 5 minute walk from the Coolin View. Si quieres un lugar donde descansar del ruido y la ciudad, y descubrir todas las joyas que reune la isla de Skye, este es un sitio muy recomendable para ello y un buen punto de partida. cosy and friendly. went out of their way to help us with a lift to the aros centre and also to the bus stop to get our bus home. cannot praise everyone enough. will hopefully be back. can definitely recommend the antlers restaurant and the west highland bar in the square. Great choice of coffees for such a small place. Too bad we didn't benefit from it because we weren't informed about it. Was a great location, near the pier and restaurants. I'd stay there again. Beautiful view, very friendly staff, nice & clean accommodations. We were there on a Monday night (7/27/2015) and it was very difficult to find a place to eat dinner in Portree. Better planning here is needed. Our twin room on the top floor was too small to accommodate large luggage. Recommend Sea Breeze for cold seafood salad and The Lower Deck form curry cream mussels. A van tour by Donald made for a complete day. Nice place with fabulous view. Enjoyed our 2 night stay in Portree. This was a very nice Guest House with a great view of the harbour. Both Eddie and Jim were very friendly and helpful enthusiastically shared their insights with regards to local attractions and supplied detailed directions. Would recommend a visit to the Faerie Glen and Faerie Pools. Very scenic drive around the northern tip of the island. I enjoyed my stay, however the location of the room was directly above the lounge and main building entrance. So unfortunately I was able to hear all the conversations and late arrivals during the night. Central location, friendly and helpful staff, a great breakfast and an unforgettable view. It is what it says it is. Coolin View staff were great. Very helpful and friendly. We had a great stay. 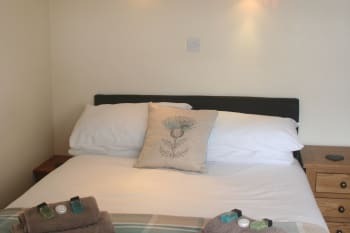 Very comfortable B & B in a fabulous location close to all facilities. We loved the view of the pier and bay from our room. Would definitely recommend to others. Eddie and his staff went out of their way to help us enjoy our stay. Big plus they made no fuss catering for a gluten free diet. Overall a very pleasing stay. Suggestions would be to install phones in each room, provide hair dryers, soften decor to make a more homey feel. Curtains, wall art, rugs,etc. Reception area could use sprucing up as it is the first impression upon entering. Great location and owner very helpful re sights to see, etc. Friendly, helpful hosts. Excellent base for exploring the island. Clean and comfortable. Would definitely recommend to others. I had an excellent stay! Everything was good, room was a little noisy, I could hear people showering/using restroom but other than that every thing was good. Sky Adventures is an awesome place for your adventures! I went rock climbing and coasteering with them and had a blast!! Super accomodations, great location. Host Jim was very helpful about local sites and points of interest. Enjoyed breakfast each morning. Close to,waterfront dining and nearby pubs. Great staff make you feel at home. Go early to get seats at water front restaurants. If you head out to Neist Point, stop by the nearby Kelpie Cottage, A very talented lady has authentic gifts to check out! This is where you should stay when you come to Portree!!! We'd loved our stay with you, but respectfully recommend some touch up cleaning, ceiling fan in bathroom and baseboards, for example. These comments should not be a deterrent for anyone who wishes to stay at this wonderful, hospitable B&B. Splendid breakfasts can be ordered the day before. Lovely building with a really great view over the bay. Friendly and uncomplicated staff. Very friendly and helpfull team, especially Jim an Eddie. Make a dinner reservation. There are not a lot of places to eat during the busy season. Excellent owners! Malcolm being my favourite! I noticed that they were very friendly and helpful with all the guests in recommending great days out, travel estimation times to their chosen day trips and local food recommendations. Very knowledgeable about the island. 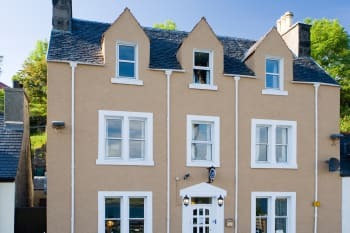 The hotel is based in the centre of Portree, just a few minutes from the local shops and cafes but situated in a quiet location overlooking the harbour. Breakfast and wifi both provided. Would stay again and will definitely recommend for my friends. Personnel très sympathique et chaleureux. Petit dejeuner continental correct. Il est difficile de trouver une table dans les restaurants de portree. Il est conseillé de s'y rendre très tôt. Super location, very friendly welcome, fine breakfast - would love to come back. Eddie and Jim where excellent hosts, very helpful and offered advice on places to visit. Would recommend a stay here. Malcolm was a great host too. If you ask Eddie and Jim they will advise with pleasure. A very warm welcome from the owner and the staff. Very nice room with excellent bathroom and what a view!!! SO, everything was ok, only the cold breakfast is quite limited (a slice of cheese / ham would make the breakfast even better). The hot breakfast (eggs, sausages, etc...) was superb!